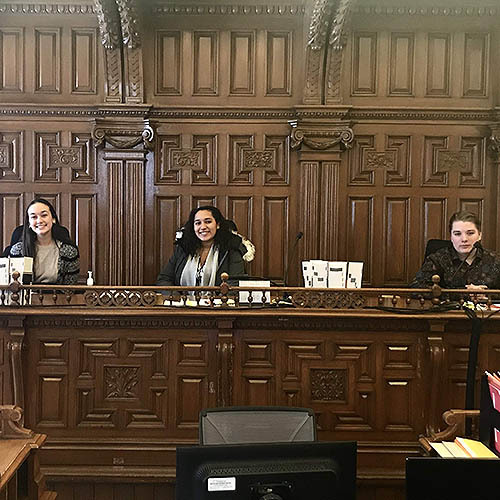 On Tuesday, January 22nd, Trinity College School’s two Grade 12 law classes left the confines of the classroom and travelled to Toronto to experience the Canadian court system. The first stop was the Ontario Superior Court where students were treated to an exclusive question and answer period with a Superior Court judge (Justice Akhtar) and two lawyers; a Crown prosecutor and defense counsel. The students arrived prepared with astute questions that challenged their hosts to reflect on their legal career paths and their insights about Canada’s judicial system. Next, students had the opportunity to sit in on actual trials. The group split up and quietly observed the proceedings in a variety of court cases. This was easily the most fulfilling part of the day. Most were fortunate enough to witness direct and cross examinations, while others listened as the judge charged the jury before they were sent off to deliberate. With mock trials approaching in the spring, students were glued to these aspects of the legal system. At lunch, the students buzzed with excitement, quietly sharing their morning experiences with one another in the courthouse cafeteria. Afterwards, the group took a short walk over to the Ontario Court of Appeal where Justice Fairburn took time out of her busy schedule to once again answer questions in an appellate court setting. Students were enlightened about the appeal process and gained a deeper understanding of the court structure. The day was capped off with a tour of Osgoode Hall and some important background about the Law Society of Ontario. Special thanks to faculty intern, Ms. Maddie Rodgers, for her initiative in organizing the day.